Westward Ho is a small seaside town with a huge sandy beach which extends 2 miles north of the town. There are areas of rock and pebbles at the southern end of the beach and a promenade above the beach. To the north of the town the beach is backed by a pebble ridge and behind this is Northam Burrows Country Park. Signs warn of strong currents, deep water around the slipway and also not to use inflatables when there are strong winds. Lifeguards in summer. See Beach Safety Guide. Various access points, including steps and slipway in Westward Ho. North of the town the beach is backed by a gently sloping pebble ridge. Dogs banned from 1st May to 30th September on most of the beach. Dogs allowed all year north of Sandymere. 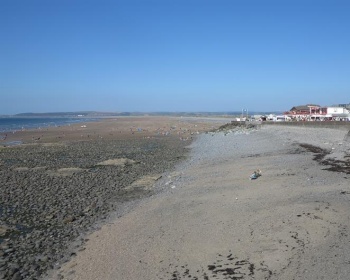 Westward Ho is close to Bideford which is 25 miles from Bude and 48 miles from Exeter. There are various routes into North Devon. From North Cornwall take the A39 past Bude and into North Devon towards Bideford. From Exeter take the A377 and approaching Barnstaple turn left at the Bishops Tawton roundabout onto the A361 and at the next roundabout go straight across onto the A39 for Bideford. At Bideford, at a roundabout turn onto the A386 signposted to Westward Ho, this road becomes the B3236. Continue on the B3236 for Westward Ho. In Westward Ho to park at Northam Burrows turn right onto Avon Lane (signposted to Northam Burrows) or continue on the B3236 for car parking in Westward Ho. 2 small car parks by the sea front and plenty of parking behind the beach in Northam Burrows Country Park. Yes, at various locations in Westward Ho. Cafés, beach shops at Westward Ho.